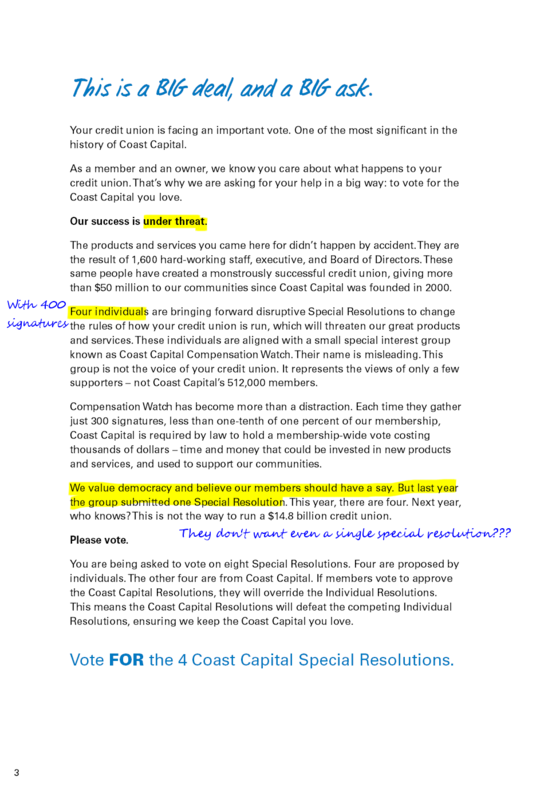 In March 2014, the Board of Directors of Coast Capital Savings declared war on its active members—members putting forward their own ideas. It did this through its repressive actions towards members who questioned their leadership. What happened was that a group of members, with supporting signatures from over 400 other members, put forward four special resolutions that aimed to reverse some of the Board’s previous decisions, and to put limits on the Board’s authority. 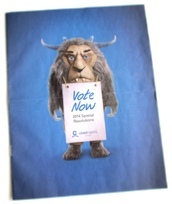 Said that the co-operative is “under threat” when members raise issues that challenge its decisions. Said that special resolutions are expensive and shouldn’t happen—an insult to the democratic process of a co-operative. Said that people proposing the special resolutions are a small special interest group attempting to undermine governance and are unworthy of consideration. The Board won the battle. All special resolutions were defeated—even the counter-resolutions proposed by the Board themselves. It was good for the Board to have their resolutions defeated because these were merely a tactical response—not something they really wanted. In the end, the power of the Board was maintained. 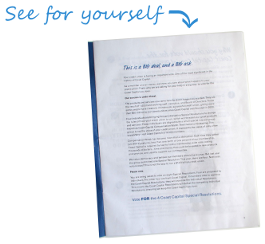 You can download the full 2014 Special Resolutions Booklet (annotated). As a candidate, you’re not allowed to tell anyone in writing (including in email) that you’re a candidate. You cannot hold meetings (i.e., three or more people together). You can speak to other people only one-on-one, either in person or by telephone. No email. Nothing written. Your Nominations-Committee-approved “candidate statement”—your only opportunity to express your opinion publicly—is limited to 100 words. The Nominations Committee reserves the right to edit your words. If these rules seem unbelievable, you can read them for yourself in the 2014 Campaign Regulations (.pdf) (annotated by me). The reason that the Board has been able to defend these rules with a straight face is that they have a simple rationale: to prevent money from affecting the elections. If you want, you can read the explanation provided by Bill Wellburn, Chair of the Board. While saving democracy from the effects of big money is a laudable goal, it’s evident that Mr. Wellburn and the remainder of the Board have killed democracy in order to save it. He lauds that “all candidates have equal opportunity to show their qualifications.” This is factually correct, but they are the words of the devil when you see what it means: all candidates have equal opportunity to say almost nothing. Discussion of issues is suppressed and nobody but the Board’s recommended candidates tend to get elected (because most members have no reason not to trust the Board). You can be sure that the Nominations Committee doesn’t recommend anyone who’s not a friend of the Board. For the 2014 vote on special resolutions, the Board of Directors engaged in a tactical response to the members who spoke out against them. The Board crafted their own set of resolutions, which partially overlapped with the members’ resolutions, and then they gave their own resolutions higher priority. For example, resolution #5 (proposed by a member) was for 12-year term limits on Board directorships. Resolution #1 (proposed by the Board in response) was also for 12-year term limits, but it “grandfathered” the existing Board members. If 80% of members approved resolution #5 and 70% approved resolution #1, then #1 would win and #5 would lose (perversely), and the majority outcome would be thwarted. Resolution #3 could thwart resolution #7 in a similar way. These outcomes didn’t actually happen, but the true outcome was just as perverse. The voting results showed that a significant number of people voted simultaneously with the Board’s recommendations and against the Board’s recommendations. Or stated another way, people didn’t understand the contradictory nature of the resolutions that they were voting for. It worked to the Board’s advantage that they created a situation that confused voters and created a nonsensical result.